My trailer park has 3 trailers, because that's how many come in the kit. I'm thinking of expanding it, but it takes up a lot of space. 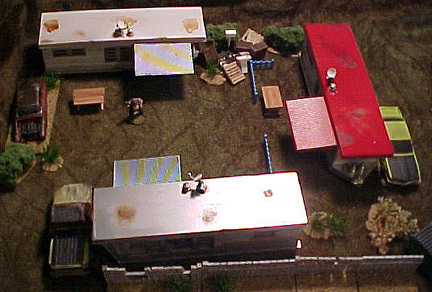 On the other hand, a table filled with a trailer park has a lot of potential. The kits are simple to assemble, and fit well. They are also designed for quick & easy painting. All doors and windows are separate. They are moulded in aqua, pink, and silver, and look pretty crappy. The plastic doesn't show the detail well, and frankly, looks like plastic. Assemble the 4 walls of the trailers. Spray paint them flat white. Lay out all the doors, windows, and chassis. Spray paint them silver. Mask off the door frame and any silver trim you want on the trailer bodies and spray silver. Roofs and corrugated canopies can be any colour you want. I added satellite dishes (from em-4) to update the look, and am going to add A/C units. Once all is dry, assemble the kits and weather them to taste. Here's a rear and end view. The Basic model is all brushed aluminium: I painted the whole trailer silver. The Intermediate model has white sides & roof, all else is aluminium. The De Luxe. I masked off the lower sides to give the trailer brushed aluminium trim, and painted the roof & awning red. 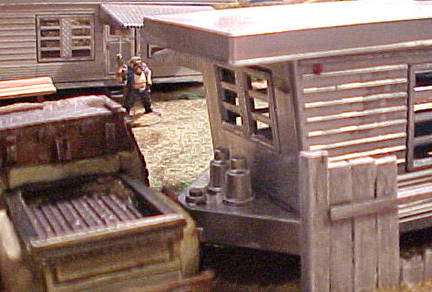 Of course all trailers aren't white, but I wanted to get away from the plasticky look of the models. The kit gives good results with little effort, and provides plenty of gaming possibilities.